Spotted Salamander (Ambystoma maculatum) is a large salamander that is found living naturally in the wild in the most eastern part of North America. An animal that is relatively common lizards and simple. Spotted salamander holds the honor of having one of the most unique characteristics evolved in the animal kingdom. This is the first vertebrates to be found where they can use photosynthesis. For years scientists believe that algae plants have a symbiotic relationship with embryos of mutualism spotted salamanders, and is responsible for the chlorophyll found in the body of this lizard beast. 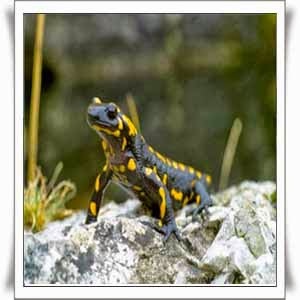 However, Canadian researchers have recently discovered pigment important for photosynthesis is actually in the cells of the spotted salamander. In addition, they found the embryo that interact with algae plants are more likely to survive and grow much faster.